The DSLR Battery Holder 4 from Think Tank eliminates the hassle of fumbling around through your camera bag searching for that extra battery. When the shot is there and you need power right away, this small, compact and efficient folding holder will help you get back up and shooting in no time. It's lightweight and can be stored easily in any optional Think Tank bag, pouch or skin. It features a fold-over flap with a touch-fastened closure and holds four lithium-ion DSLR batteries of standard size. For durability, it's made from rugged rip-stop nylon. Box Dimensions (LxWxH) 7.9 x 3.9 x 0.5"
DSLR Battery Holder 4 is rated 4.8 out of 5 by 111. Rated 5 out of 5 by Edward from Perfect Solution for Extra Battery Stora Once again the photographers at ThinkTank have come up with a solution for working photographers. Miniature batteries are hard to manage, especially distinguishing the used from the freshly charged ones. Unlike DSLR batteries which keep on going, small cameras like the Leica M9 and Sony A7 have small batteries which don't last long. Consequently you need several, and a way to store them. 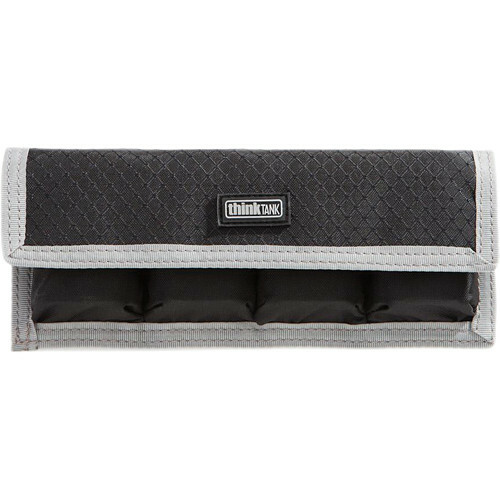 The ThinkTank battery holders are perfect - efficient, slim and easily stowed. Furthermore, batteries are dept separate so there's no chance of shorting and possibly causing a fire. TSA regulations require this for extra batteries, and ThinkTank comes to the rescue. Rated 4 out of 5 by Borreson from Not Just For Batteries anymore First off; Why I knocked off one star to give a 4 star rating: ThinkTank, you misplaced the velcro. With my batteries secure in their pockets, and flipping down the flap to close things up; the velcro hooks don't match the loops. The pockets easily fit my Olympus BLN-1 batteries. The pockets easily fit my Nikon EN-EL3e batteries (without the plastic cover). It's a little snug, but the pockets will fit the EN-EL3e with the plastic cover. However, in either case, when just flipping the flap to try to capture the batteries, the hooks and loops don't line up. When I do match things up there is a noticable gap above the battery. This can be a problem when you're trying to pack your bag as tightly as possible. ...just saying As indicated in the headline, the pockets are great for any other small items you may have. I'm using the 2 inside pockets for the Olympus SEMA-1 microphone adapter and mic. Rated 5 out of 5 by MattyP from Must have for those with bulk batteries Currently I own 4 (soon to be 5) of these battery holders, to hold 8 LP-E6's and 12 NP-FW50 batteries (Sony). Having small batteries makes them prone to losing much easier, and the TT Battery Holder makes sure you won't be doing that. It perfectly fits LP-E6 batteries, and for the NP-FW50 it is loose, but they won't be falling out if the flat is secured on. Rated 5 out of 5 by Dean from Why didn't I think of this? Tired of searching for your batteries in your camera bag? Want to keep your batteries under your down coat when photographing in Yellowstone in winter? This is the perfect thing. I have two of them and don't know how I got along without them. One holds my Olympus OMD E-M1 batteries and the other holds the E-M10 batteries. Fully charged batteries go in contacts down; when the battery us used up then the contacts are up. This is a wonderful and inexpensive solution from one of the best camera bag makers on earth. Rated 5 out of 5 by Koo from The Good Think I got this holder free with other purchases. Think Tank designs this holder for smaller size camera batteries, such as the Nikon En El15, how you load them depends on your needs, and its closure helps to keep contents inside the designated space. Very useful. A simple word of caution for anyone who are not familiar with this or similar product, it is design with specific types and sizes of battery in mind, so check compatibility first. The stiching is solid.just be sure to clean the velcro closure once in awhile. Rated 5 out of 5 by Diana from Love it so much, I bought a second I have three cameras to shoot video with and storing batteries was a perennial problem. I bought one of these for the two Canon Mark II cameras that totaled six batteries that weren't in the camera at one time and then bought a second for the remaining two and the Canon T2i. So now I have a place for all of my batteries. Like others say, a strap would be nice but not essential. I've never bought a Think Tank bag before, but I have bought a few of their accessory items and those are very well thought out. Rated 5 out of 5 by Calvin from Battery management solution I used to just keep my batteries loose in a pocket of my camera bags with with multiple backup batteries for two DSLRs it made sense to organize them. Now batteries are easier to find. Hi, does it have a belt loop or something to attach to a belt? Thank you! Depends on then it was purchased. I have two of these that were purchased about a year apart. There is a belt loop on the back of the newer one. The loop is large, a little less than 4 inches wide. It should be able to fit a belt up to 2 inches tall. will this securely hold sony a7rii batteries? Works fine for me--the closure keeps them in the pockets. Will this hold the Fujifilm XT1 battery snugly or in another words is the pocket stretchable/ collapsible ? Not snugly, no. There is no stretch to the pockets and my Canon 7D MKll batteries fit snugly. My Fuji XT2 batteries fit fine but are smaller than the Canon battery so the fit is looser. The Canon battery used to stick out the top of the pocket a bit, too, but the Fuji battery does not. It still works well for my Fuji batteries, though, IMO. Will it hold the new NP-FZ100 batteries for Sony a9? will this hold GH5 batteries? Yes. I use it for the same type of battery. Its very durable too. Will it hold Sony NP-FV70 batteries ? Will this fit the Olympus BLH-1 batteries? (OM-D MKII). Thanks. I don not know anything about Olympus or the size the model's batteries, What I can tell if that each pouch holds one battery and I have two Canon DSLR cameras with two diffrent size batteries. It holds them nicely including them in their protective trays. I have also disc covered that each pouches can hold two memory cards in jewels case. In other words eight cards in total. You can always order it to try. If it does work, B&amp;H makes returns very easy and seemless. What battery holder would you suggest for NP-F970's? Elliot, If you are considering the aforementioned battery, it will not fit in the TT Battery Holder 4.